Chattanooga FC's Jonathan Ricketts (25) plays the ball amid the Atlanta Silverbacks defense during the National Premier Soccer League Southeast Conference final at Finley Stadium on Saturday, July 14, 2018 in Chattanooga, Tenn.
For the homegrown Chattanooga Football Club, which has had an average attendance of 3,600 fans in 94 home games since debuting in 2009, officials' belief is the market is not big enough for both to survive. "Both clubs agree this is an extraordinary city," CFC chairman Tim Kelly said. "While it is possible rivalries can create an expanding market, when you divide numbers it is not a big enough market for us both by any normal calculation. The Red Wolves' intent is to put us out of business, but we have said from the start we are never going to leave Chattanooga." Despite understanding the success story of the CFC and its established fan base, Red Wolves owner Bob Martino thought Chattanooga was a prime location to build his professional franchise that is considered on the soccer pyramid as Division 3 of U.S. Soccer. The Red Wolves, part of the inaugural United Soccer League's League One 10-team division that launches this March, believe a metropolitan area with a population over 500,000 can find ways for both teams to co-exist. "Chattanoogans have shown innovation and community," Red Wolves GM Sean McDaniel said. "I don't see the spirit changing just because we have more fun sporting events to go to. We are the beneficiaries of not just soccer growth, but the growth of population, economy and culture." The Red Wolves also will have a feeder program, which will operate out of Dalton, Georgia in hopes of providing next-level talent to the soccer club, which plans to announce in February where its home stadium for 2020 will be located. In terms of booming soccer communities, Atlanta and Salt Lake City have been set as outliers over the years. The recent MLS champions from Atlanta United have recently provided a significant jolt to soccer interest in the Southeast. Both soccer-booming cities have averaged an attendance per capita of more than one percent. As one of the biggest success stories of a lower-level soccer program in the United States, the CFC averages "close to ".80 percent" in attendance per capita. Those who helped found a local football club with 99 career wins realize the threat of another professional team coming into town. "Could we realistically expect two Chattanooga Lookouts to exist?" questioned CFC cofounder Sheldon Grizzle. "Or even a second Chattanooga Aquarium in town? When we founded CFC we were invested in the community, not about profit. We have always tried to be real and authentic." Over the last 10 years the city's Double-A baseball team has averaged 3,343 fans per home game. The Lookouts, too, will be competing for a share of the summer sports fan draw with three professional teams in town now. Local soccer fans have expressed their feelings on where their allegiances stand. "I have only watched soccer for a few years, so I never was grandfathered into CFC when they first started," Red Wolves supporter Eric Sisson said. "I think the Red Wolves will have the best overall talent and product. I think they give Chattanooga a better chance to be a national brand in the long run." Meanwhile, the CFC looks to continue to fill Finley Stadium for the next three seasons at least. 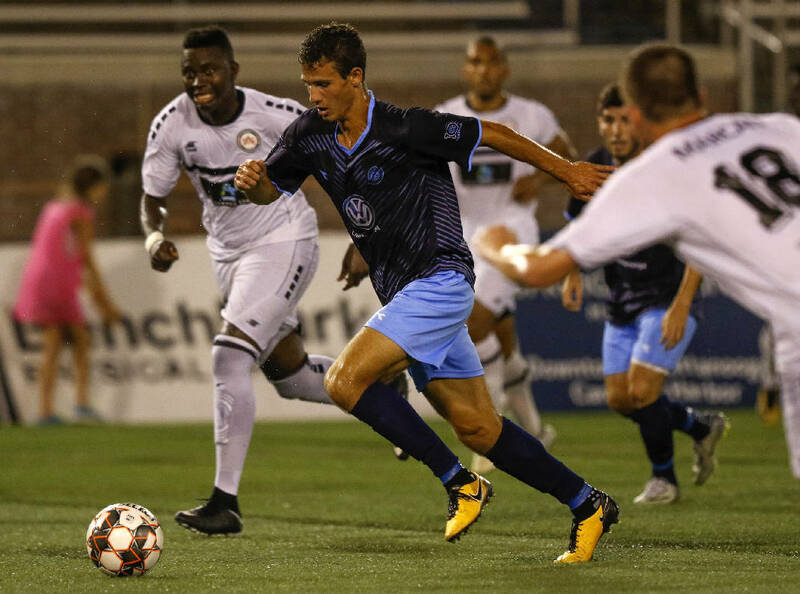 "Chattanooga Football Club has built something special in this city," said Matt Van Duinen, who is a member of CFC's rowdy supporters knowns as the Chattahooligans. "Many people who are on the outside looking in think that makes Chattanooga a soccer city, but when you are at the matches and take it all in, you realize Chattanooga is a CFC city. "Introducing another team that isn't CFC is fighting an uphill battle, one I don't think can be won. Ultimately a battle that will hurt all soccer teams in Chattanooga." In a city with a well-developed knowledge of soccer, which has drawn crowds of more than 10,000 fans on four different occasions over the past 10 years, only time will tell if each team can survive or if one's future is ultimately doomed. "I hope Bob Martino is committed to making it his life's work, because we are," the CFC's Kelly said. "We are not going anywhere. We live here. This is about franchise corporatism versus localism." Contact Patrick MacCoon at pmaccoon@timesfreepress.com or 423-757-6311. Follow him on Twitter @PMacCoon.